ImTOO FLV Converter is a professional FLV video converter software to convert FLV to AVI, MP4, DivX, etc. It is also a video to FLV converter to convert AVI to FLV, MP4 to FLV, WMV to FLV video format. Likewise, it can convert audio files such as MP3 to FLV and SWF audios as a FLV audio converter. 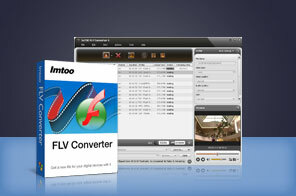 ImTOO FLV Converter helps you convert Flash video (FLV) to all types of videos for playback on portable media devices. It is able to convert FLV to AVI, MPEG, MP4, 3GP, WMV, MOV, DivX, and XviD etc. Moreover, this FLV video converter can also convert various videos to FLV and SWF flash videos like convert AVI to FLV, MPEG, WMV, DivX, MP4, MKV, H.264, RM, RMVB, MOV, XviD, 3GP, ASF, VOB, M4V to FLV. With ImTOO FLV Converter, you can conveniently upload the output FLV videos to YouTube.com and other video websites, and enjoy MP4 videos converted from your desired YouTube FLV videos on iPod, PSP, iPhone, and WMV videos on Xbox. Convert FLV to AVI, MP4, MPEG, WMV, 3GP, MOV, RM, DivX, XviD. Convert AVI, MPEG, WMV, DivX, MP4, H.264/AVC, AVCHD, MKV, RM, MOV, XviD, 3GP to Flash FLV videos. An audio to flash converter to convert MP3, MP2, WMA, M4A, AAC, AC3, OGG, APE, CUE and audio CD to FLV. CD decoding is supported. Support for multi-core CPU means you can simultaneously convert many files at the highest conversion speed. We ptimized the profile parameters of GPU acceleration. ImTOO FLV Converter now supports profile parameters: Main, Baseline and High. Support NVIDIA CUDA & AMD APP technology to gain the remarkable performance in FLV video conversion. Batch conversion and multithreading allow you to convert multiple files at one time with just one click. Select any segment of one file to convert by specifying its start time and duration; split one file into several. To get the output file size you want, enter its value in Bitrate Calculator with the bit rate calculated at once. Export batches of files in the same content by adding multiple same or different profiles to one source to convert. Manually adjust many video/audio parameters like bit rate, frame rate, sample rate, codec. During video conversion, you can run ImTOO FLV Converter in the background to save much resource. Auto shutdown and other after-done actions will release you from waiting to the end of every task by your computer. Preview the input file before conversion or during the process, and the output file after conversion is done with the built-in resizable player. Take a snapshot of favorite movie images when previewing and save them as JPG, PNG, GIF, and BMP files. Offers the function of power management. Tutorial : How to convert to FLV file and SWF file with ImTOO FLV Converter? How to convert AVI to FLV with AVI to FLV Converter? MPG to FLV Conversion: How to convert MPG to FLV? How to extract MP3 audio from YouTube video? YouTube to AVI: How to convert YouTube to AVI video? YouTube Video Editor - How to edit YouTube videos? How to put YouTube videos on PSP? How to download multiple YouTube videos simultaneously? Tip: How to download HD YouTube videos?